Amazing Kola Nuts & ONLY 7 calories! 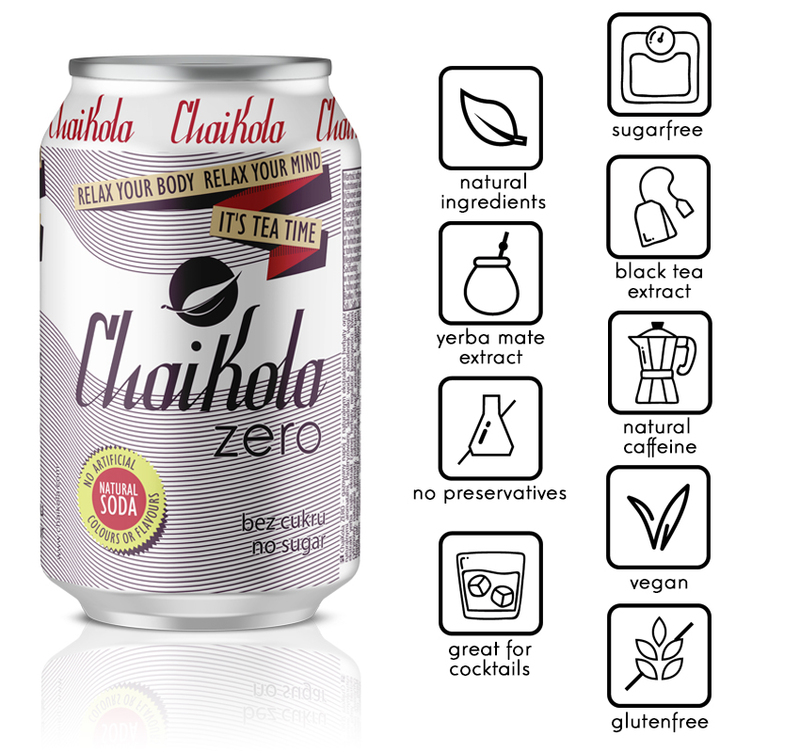 ChaiKola ZERO is a new, sugarfree edition of our premium natural ChaiKola. ChaiKola ZERO is dedicated to all who can not or do not want to consume sugar. Beside the sweeteners all ChaiKola’s ZERO ingredients are natural. Thanks to black tea and yerba mate extracts enriched with ginger, cinnamon, cloves and kola nuts ChaiKola ZERO brings you an enjoyable sense of relaxation, no less than the original version. Enjoy the authentic taste of ChaiKola ZERO and keep your low sugar and low calorie diet perfect. ChaiKola ZERO contains only 7 calories in one can! Likwise all Wild Grass beveraes ChaiKola ZERO does not contain any presevatives. ChaiKola ZERO is gluten free and 100% vegan. ChaiKola ZERO is a beverage for all who CARE about good, and tasty diet products. ChaiKola ZERO is for those who CARE about quality and seek clear label. Water, carbon dioxide, yerba mate extract, black tea extract, acidity regulator: citric acid, natural flavors, acesulfame K, aspartame. Contains no preservatives. Pasteurized.